The Park Hyatt St Kitts is located in the Christophe Harbour area on the island of St Kitts. The resort sits about 30 minutes from the airport on the southeast peninsula overlooking Nevis. If you are visiting this resort, you might choose to leave the resort to venture into Brasserie, take a boat over to Nevis or visit nearby Christophe Harbour restaurants. But with all the amenities and dining options, you don't have to leave the resort. So the Park Hyatt St. Kitts is great for those who just want to lay around and relax or for those who want a more adventurous trip full of excursions and site seeing. We planned our visit to the Park Hyatt St Kitts back in the spring of 2018 so the anticipation built up for quite awhile. And lets just say this luxury resort was worth the wait. The Park Hyatt St Kitts just opened their doors in November of 2017. And the resort did not disappoint. Upon our arrival to the Park Hyatt St Kitts, we were very tired after traveling all day. So all we wanted to do was get checked into our room. From the front drive of the hotel we were escorted down a very wide candle lit sidewalk that was surrounded by water to the lobby of the hotel. There we were greeted with a cold damp towel and a glass of champagne. Definitely a nice touch! The Park Hyatt St Kitts consists of several dwellings with many different types of rooms. Since the resort is a bit spread out, we were given a ride on a golf cart with our luggage to our room. The rooms boast a very luxurious yet modern beach feel. Lots of white painted wood mixed with warm tones of mahogany. During our stay we had the opportunity to stay in a Beachside King Room as well as a Park Executive Suite. Both rooms were very comfortable boasting plenty of space, incredible spa like bathrooms with freestanding tubs, walk-in showers and a closet. The rooms are decorated very simply as not to distract from the colors of the Caribbean and the resort. Each room at the Park Hyatt St Kitts features either a private balcony or terrace. The luxurious spa like bathroom featured a double vanity, a free standing tub, a walk in shower and a separate toilet room. 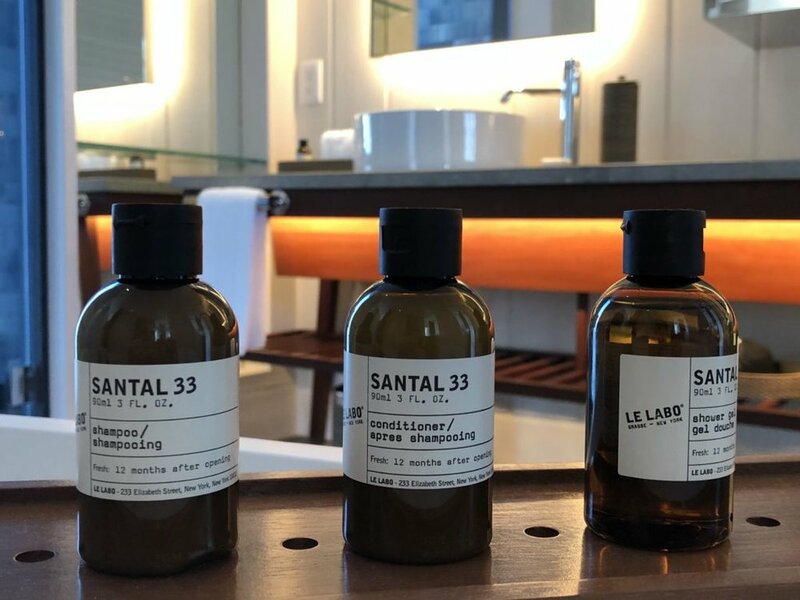 And the best part is Park Hyatt has some of our favorite brand of toiletries Le Labo! There are three dining options at the Park Hyatt St Kitts. There is the Great House (main restaurant for breakfast, lunch and dinner), the Fisherman's Village (seafood lovers heaven for lunch and dinner) and the Stone Barn (adult only dining for dinner). Since we visited during slow season the Stone Barn was unfortunately closed. However, the Stone Barn menu was being served in the Great House in addition to the Great House menu. We ate breakfast each day at the Great House. They have a nice breakfast buffet that is very European with lots of cheese, smoke meats, pastries and fruit. There were also a variety of hot food items each day. And the pastries were delicious! If buffets aren't your thing, they have a great breakfast menu as well. All of the meals we at at the Great House were absolutely incredible. We also had the opportunity to do a coffee tasting class. During the class we were taught about coffee, how it is grown, roasted and brewed. We got to taste coffee that was brewed by six different methods, each with it's own unique taste. And since we are self proclaimed coffee snobs, this class was obviously something we really enjoyed! Another thing we really enjoy about Hyatt properties such as the Park Hyatt St Kitts is that they truly understand the need for great craft coffee. In fact most luxury Hyatt properties feature a barista and a craft coffee menu and the Park Hyatt St Kitts was no exception from this. The Park Hyatt St Kitts has plenty of things to do. There are several paths to walk around the resort, there is a nice stretch of black sand beach and plenty of opportunities to relax and connect with nature. Not to mention the incredible views of Banana Bay that can be seen from all over the resort. The resort features two pools. There is the adults only pool (Rampart Pool) with cabanas and incredible views of Banana Bay. And there is the main pool (Lagoon Pool) that features a man-made beach, and a zero-entry infinity edge pool. Both pools feature full-service food & drink. In addition to the pools there is the Beach Shack with has all kinds of non-motorized watersports activities such as paddle boarding, snorkeling, and kayaks. 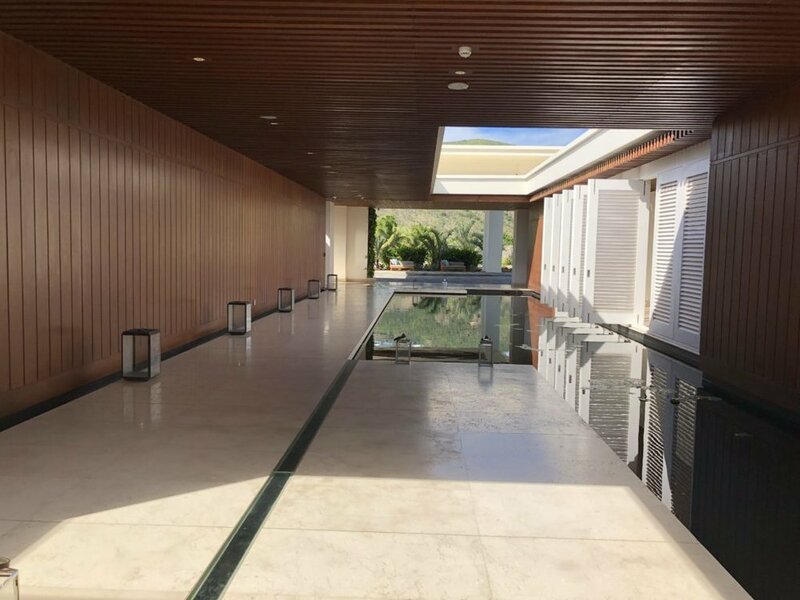 The Park Hyatt St. Kitts also features a Miraval Life in Balance Spa with separate men's and women's facilities such as a steam room, sauna, hot tub and outdoor showers. The facilities were very well maintained and the staff was very attentive and friendly. It can be a struggle to get a decent workout in on vacation. But the fitness center at the Park Hyatt St Kitts won't disappoint. You'll find plenty of cardio equipment, free weights and machines to get your blood pumping. And of course afterwards, take advantage of some time relaxing in the steam room and sauna. The Park Hyatt St Kitts is a great place to relax unwind and live on island time. Despite the fact that St Kitts can be a hard place to get to, this 5-Star resort makes the hours of travel worth it in every way. And the staff at the Park Hyatt St Kitts is incredible. Everyone made an effort to get to know us. Toward the end of our stay everyone was calling us by name as if we were family. And remember, if you book with a Hyatt Prive travel agent like Virtual Travel Gurus, you’ll get extra benefits like complimentary breakfast, up to a $400 resort credit, a room upgrade, early check-in and late check-out! And occasionally the Park Hyatt St. Kitts offers promotions like the 4th night free when you book through a Hyatt Prive travel agent. So take advantage of some of the promotions and go visit this new luxurious resort. You won't regret it!